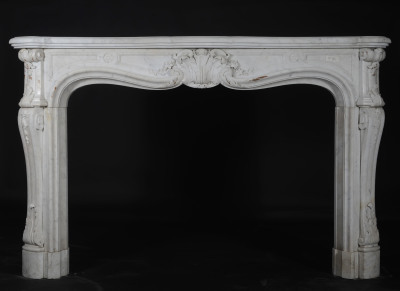 An imposing, elegantly carved Louis XV fireplace in white Carrara marble. 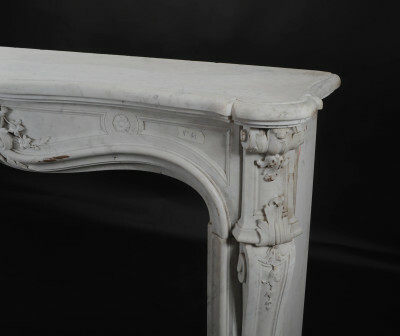 This is a characteristic model of the opulent Second Empire style, where the finess of the sculpture exploits with brilliance the beauty of this flawless marble. 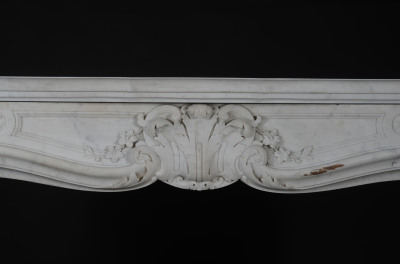 The panelled frieze is centered around an exquisitely carved shell, adorned with delicate flowers as well as foliage in volutes on the head of the entablature. The shaped jambs are decorated with scrolled acanthus leaves with cascading bell flowers. At the base, scrolled acanthus leaves sit on raised supports.